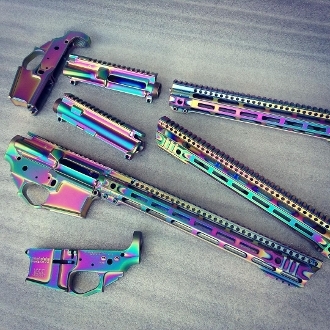 Be like Thor and summon the bifrost with this crazy Ar15 builder set. After an overwhelming demand for our other Oilslick finished parts, we decided to try a few upper/lower/rail builder sets. They came out looking awesome as you can see. You need this. The upper/lower/and rail are aluminum, then plated with nickel before being finished with the oilslick PVD. Note: Due to being raw prior to coating, the stripped uppers on these have a couple small cosmetic blems underneath the coating. It will not affect function. These will ship with an accu wedge as well as a tension screw for the lower for a super tight fit.